Thanks to Ms. Joffin-Mari Alcantara for forwarding this school project idea. Her sixth graders at Janis Dismus Middle School of Englewood, New Jersey created cool “cribs” for the campers at Camp Half-Blood to chill in. 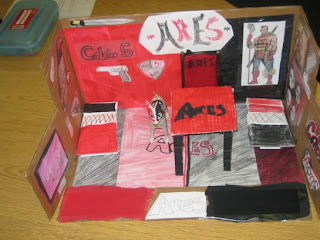 The Ares cabin is above.